Earn $1.99 in Rewards credit (199 points) What's This? Both front and rear lights in Lezyne’s KTV Drive Light Set feature durable construction, multi-modal function, and focused LED illumination, making this set a powerfully defensive duo in the face of nighttime and low-light riding conditions. Composite matrix construction - high-strength fiber reinforced material - make these lights both lightweight and resilient for dependable illumination year-round, no matter the weather. Both front and rear have multiple modes of operation. The front light offers 5 modes - 3 flashing (including Day Flash), Economy, and Blast - ranging from 15 to 180 lumens. 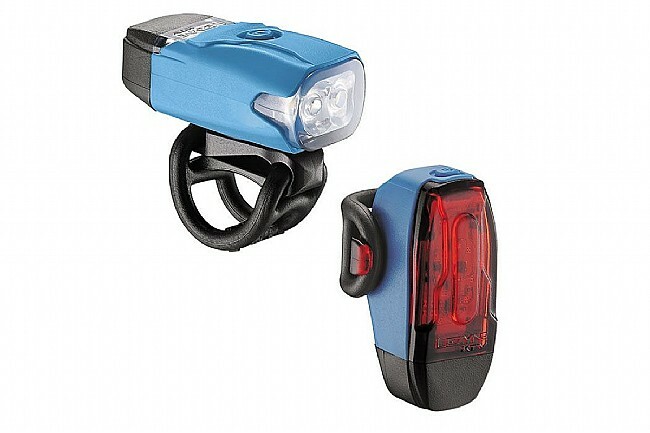 The rear light provides 2 flash modes, Pulse, Economy, and Blast, ranging 3 to 13 hours runtime. To ensure optimal lighting, these lights are equipped with two bright LEDs, each, as well as side cutouts for 180 degrees of visibility - front and rear. Blast: 70 lumens, 1hr 30mins runtime. Economy: 15 lumens, 5hrs runtime. Day Flash: 180 lumens, 5hrs runtime. Flash 1: 30 lumens, 8hrs runtime. Flash 2: 15 lumens, 12hrs runtime. Blast: 10 lumens, 3hrs runtime. Economy: 3 lumens, 7hrs 45mins runtime. Flash 1: 10 lumens, 9hrs runtime. Flash 2: 5 lumens, 13hrs runtime. Pulse: 10 lumens, 4hrs 15mins runtime. Other styles of this product are available. Have several lights from Lezyne - this is perfect set for daytime running light.